This attractive and unique gift basket for him features a keepsake trunk that can be used as a desk accessory, planter or decoration for Dad's office or garage. 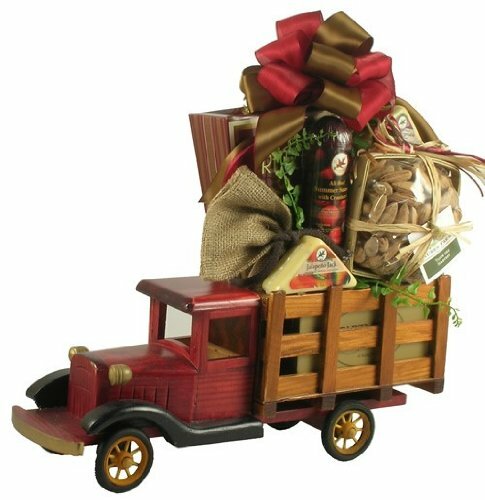 Faatures a classic wooden truck from years gone by to deliver the gourmet dad snacks in this gift basket for dad. Meat, cheese, nuts and more, what else could dad want to satisfy a snack attack on his special day? Imagine how special your dad will feel when the package arrives at his door and he opens it to find a truck load of tasty treats. Snacks selected to meet the snack preferences of the classic dad that likes to munch bu knows he shouldn't. Made in the USA by our professional staff of gift basket designers and usually ships the same day we receive your order.